BATTAMBANG Cambodia (Reuters) - Brigadier General Sar Theth is the police chief of Battambang, a languid riverside town in western Cambodia. You could also call him the seven million dollar man. On Sept. 19, Sar Theth's officers tracked three Thai men in a pick-up truck as it passed through a remote border checkpoint from Thailand. When the truck stopped in the Cambodian district of Phnom Proek, the police pounced. "If I close my eyes and touch it, I wouldn't know it was fake," he said, rubbing one of the seized notes between thumb and forefinger at Battambang police headquarters. The alleged involvement of Thai military personnel - the three men arrested were serving or former officers of the Royal Thai Navy - could also embarrass Prime Minister Prayuth Chan-ocha. A former general, Prayuth seized power in a May 22 military coup and has vowed to crack down on organized crime. There is more than $1 trillion cash in global circulation, three-quarters of it outside the United States, according to the Secret Service. Tackling counterfeiting is key to maintaining the dollar's credibility as the de facto world currency. Less than a quarter of 1 percent of that $1 trillion - or about $2.5 billion - are fakes, said J. Kevin Traylor, a Secret Service agent based at the U.S. Embassy in Bangkok. "For the amount of currency out there, we have very little counterfeiting," he told Reuters. "That's why the dollar is trusted." 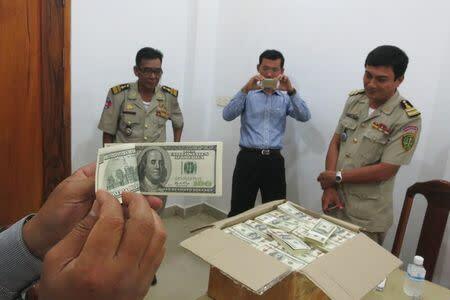 Traylor, who visited Battambang to inspect the $7.16 million haul in early October, said $1 million of the same "better-than-average" fakes had already been seized in Thailand. One person has been arrested in the Thai investigation. "It is a note that is starting to be manufactured in larger quantities and our investigation points to Thailand as the origin," he said. "We will continue our efforts to locate the plant." In 2013, with Secret Service help, Thai police made 67 arrests and seized $3.7 million in fake dollars. This year's tally is already at 76 arrests and $5.6 million seized, not including the Cambodia bust. But offset printing - in which the inked image is "offset" from a plate to a rubber blanket and then onto the paper - is still commonly used outside the United States to produce convincing fakes in greater volume. The process requires expensive inks and presses, as well as skilled artists. "You need talented people to do this," said Special Agent Traylor. And time: he reckoned $7.16 million could take perhaps two months to make. Royal Thai Navy spokesman Rear Admiral Kan Deeubol confirmed to Reuters that the three Thai men arrested on Sept. 19 were serving or former naval officers. One of them - Chamras Pongsart, 52, a navy captain - was released after two days. "He was not involved," said Sar Theth. "They have not been suspended, because the investigation ... is under way and we don't know if they really committed wrongdoing," said Kan. The criminal group making the fakes in Thailand is well-organized and linked to other scams, said Traylor. Ongoing investigations disrupted their operations and forced them "to try Cambodia as a new market". But Sar Theth said it was "impossible" to shift so many bills on Cambodia's fake-savvy black market. Even farmers might find the notes suspect, he said, never mind banks or owners of currency-exchange booths. Chi Kimcheav, 47, a money changer at Battambang market, said she relied on touch to detect fakes, which were often betrayed by poor quality paper. "I've been doing this job for many years," she said. "If someone gave me a fake, I'd know it."